This little fella could be just as easily used a small side table as a stool but we like the idea of him providing a place to sit. 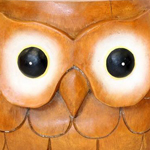 Each one is unique to the buyer because they’re individually carved from Mango Hardwood that is reclaimed from the tree at the end of its useful working life making the Owl Stool an eco-friendly piece of furniture. The use of organic paint round the characterised eyes is a lovely attention to detail and works well with the simplistic outlook of the design as a whole. Look closely and you’ll see there’s a slight two tone to the finish this is due to the high presence of spalting in the timber and adds to the appeal of the stool. Great quality,heavy! solid wood stool could also be used as a small table. Excellent product, just as described. Fit well into my daughters room.